The first time that I ever had beef heart was at St. John’s Bread and Wine in London. It was two summers ago and I was wandering around Spitalfields on a single-origin chocolate bar search. Suddenly, the skies opened up and down came the deluge. Soaked and woefully unprepared, I ducked into the empty restaurant right in the middle of the family meal. Although I’m sure that the last thing the staff wanted to deal with was another guest, they were extraordinarily gracious as they served me a late-afternoon snack of oysters, Sauternes, grilled beef heart and celeriac slaw. Sauternes and oysters, you say? Yes, the server was intrigued as well. I had ordered them together because I had just read an article about how the original pairing for oysters was Sauternes, not Champagne. In any case, I assure you that the combination is divine. So was the beef heart. Flavorful and surprising tender, it had a robust beefiness and was the perfect antidote to the grey, oily weather outside. As I enjoyed the last dregs of my wine, I remembered that I had a copy of Fergus Henderson’s Nose to Tail Eating: A Kind of British Cooking collecting dust at home. When my CSA (shares are still available, by the way) began offering beef heart, I decided that I was going to bite the bullet and try to recreate that terrific snack. The recipe is such that no actual measurements are necessary. Follow your instinct and taste as you go along. You will be fine. 1. The first thing you will need to do is trim the heart. You basically want to remove all the fat, the membranes, and any and all vessels including the aorta. It may be a little disheartening (no pun intended) to have to discard all those trimmings, but you really only want the tasty bits. For this, you will need a very sharp knife. When you finish, you should be left with a pile of very lean beef slices that no longer resemble a heart at all. For an instructional video, I refer you to Michael Ruhlman here. 2. In a dish large enough to fit all the beef slices comfortably, drizzle them with olive oil. Add a healthy slug of balsamic vinegar. Sprinkle it generously with coarse salt and freshly ground pepper. Add a few sprigs of fresh thyme. Toss, cover, and let marinate in the fridge for 8-24 hours. 3. 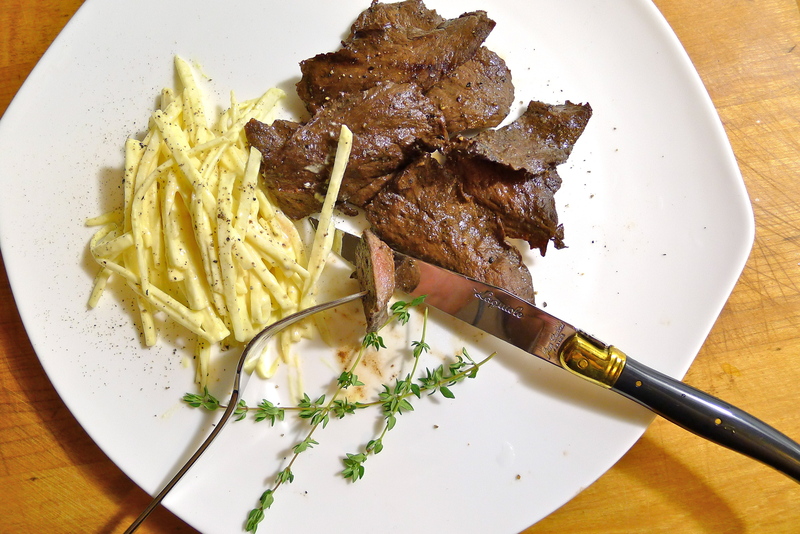 Before grilling the beef heart slices, set up the celeriac slaw. The first thing you will need to do is trim the root. You could use a vegetable peeler . . . if you want to have an accident! Or you could use a very sharp knife and be safer. You will have a lot of trimmings to discard as well, but trust me: you don’t want these trimmings either. If you must, you can put them in a bag and toss them in your freezer to use for stock. First, slice off the top of the root and level off its bottom. This will ensure that it won’t rock around while you are trimming it. Holding your knife perpendicular to the root, shave or slice off the outer gnarled surface. You should be left with a clean, peeled root. For another helpful video, I refer you to Gourmet Magazine. Now you need to julienne the celery root. This can be accomplished most effectively by using a mandoline. If you don’t have one, or do have one but are too lazy to look for it like me, you can use a sharp knife again for the job. To julienne the celery root, cut very thin slices of it, stack the slices up and cut them into matchsticks. Melissa Clark demos this here. For the dressing, gently stir together 4 tablespoons of crème fraîche for every one tablespoon of Dijon mustard. That’s the ratio that I used, but you can increase the amount of mustard if you want your dressing to have more of a kick. Adjust the seasoning if necessary. Using your hands, toss the julienned slices of celery root with the dressing. 5. Prepare the grill. Brush it with oil and get it nice and hot. Cook the beef heart slices until they are medium. Henderson says about 3 minutes per side, but mine cooked faster than that. I would say to just watch them and pull them off the grill when they are ready. To serve, plate a few slices with a nice mound of celery root slaw. This looks out of this world delicious! Would love to have you around as my personal chef 🙂 ! all kidding aside, Happy Valentine’s day, my friend! Mine was special this year because I was devouring bacon nougat…….MMMMMMM!!!!!! Thank you, Brie! And yes: Happy Bacon-y Valentine’s Day! I’ve never had much success with heart … your’s looks great. I must try again sometime! This was my first time with heart too. It helped to have a reference. The next time, I might play around with the doneness more . . . I think heart can be a little on the bloody side. It is a muscle after all! Happy Valentine’s Day! Have chocolate for dessert! Yeah, thanks! We do dance in the living room when one of our favs is played. I would too! Love the music you post on your blog! This looks great. I’ll look for beef heart the next time I go to France because I feel more comfortable with organ meats from there. Yes. I definitely feel more comfortable with organ meats in France. When I see calf’s liver here, I just think: hmmmm, how much of that do they move? Interesting, I normally don’t see beef heart around here in Hungary, we are more used to chicken heart (that actually comes together with liver), I love those too! I made beef heart stew a few weeks ago. It turned out tough and chewy. I was very upset. Of course, yours beef heart looks great! What do you think is the best cooking technique for beef heart? Beef heart is so cheap at the grocery store. I’d like to find better ways to cook it. Maybe slow and gentle heat is the way to go? I am looking forward to finding more ways to cook such an economical cut! Could it be made into jerky strips? Rabbit is very lean also and I made rabbit jerky. It turned out pretty good. I did a quick google search and there seems to be tons of people who have made beef heart jerky and love it! Try it! I can’t wait to hear the results! Happy belated Valentine’s Day to you too! Heart is quite yummy. Steve and me were actually discussing this post while he was here! It really is kind of the least organ-y or the organs, if that makes any sense. If you try it, please do let me know how it goes! Daisy, how did you make beef heart look so good??? The first time I encountered heart was on a big outback Australian cattle station. I was going out with the owner’s son at the time, and they’d been yarding cattle. A big bullock broke it’s leg, so they shot it, dressed it and hung it for meat for the station hands. But they took the fresh heart and stuffed it with minced liver and kidneys, boiled it up and served it up as a delicacy at dinner that night in my honour with a white parsley sauce. I’d love to say it was yummy, but it was like rubber, and awful beyond belief. I choked down every mouthful. I wonder if I’m brave enough to try again? When we do a kill here on our farm, our dogs usually get the heart for dinner! Aw! Well, I think it helped to have had it at the restaurant. It gave me a reference. That heart that you described in the outback sounded well-intentioned but totally untasty! I don’t think that heart is the best cut to boil since it is so lean and the muscle fibers are so dense. I am not a kidney fan. I was out at lunch with some friends and their kids once, and everyone was insisting that I have the steak and kidney pie. I declined and ordered vegetarian lasagne, but their son kept banging on about it. Finally, to shut him up, I told him why i wouldn’t eat kidneys. They’re organs I said. Their job is to filter impurities from your body and turn it into urine. Oh My God, the boy screams at the top of his lungs in the crowded restaurant. Mum’s making me eat piss filters. Aaaaagh! Don’t eat the steak and kidney pie. It’s piss filters. Aaaaagh. They never did take me to lunch again. HAHAHAHA! Oh my gosh, Nicole! You had me laughing so hard I was crying! Yes, I am not the biggest fan of piss filters either 😉 No reason to not invite you to lunch again though! Awww! I’m sure! I wonder if that kid ever had a steak and kidney pie again . . . Kids are funny like that. When I was a kid, I used to love shark’s fin soup. Did I know they were endangered? Nope. Because I was five! But one day, my father explained to me that what I was eating wasn’t vermicelli noodles, but shark’s fin. For real-sies. Haven’t touched it since (nor would I because they’re endangered). Wow this idea is really fresh, I never knew turning calfs liver into some delicious fancy meal. This celeriac thing is also new to me. Let me check if they have it in the market.. Thank you, Mama Miyuki! The heart was very good! I like a good calf’s liver too — but only if it is fresh and done well. If you try celeriac, let me know how you like it! I hope you had a wonderful Valentine’s Day. I’ve never seen heart sold in the markets here in New England. Your preparation with the celeriac slaw sounds like it was very good. Thank you, Karen! I hope that you had a wonderful Valentine’s Day too! I don’t think that I have ever seen beef heart sold in any of the markets in New York either, but it’s probably available at more of the ethnic markets. I got mine through my CSA. The slaw was great, but I love crème fraîche and mustard, so it’s a no brainer 🙂 Thank you again for the lovely comment! Thanks, Trixfred! It actually just tastes like steak. Maybe there is a little more of an iron-y flavor, but it’s pretty much just very lean steak. I think the trick is just cooking it properly so it’s tender. Yes, the whole horse meat thing is making everyone worried, no? But my French and Italian friends are very unaffected. They just wonder what the big deal is about! As intriguing as you make it sound, I will still not be cooking any beef heart! But can’t wait to try that mustard-y slaw. Yum. Happy Valentine’s Day Daisy!! Let me know if you try the slaw! The crème fraîche makes it pretty rich. Happy Valentine’s Day to you too! My favorite organ meat? Probably sweetbreads. But heart probably is a close second. It really just tastes like a beefier steak. Speaking of Asian cooking, I probably have had all kinds of stuff without knowing it too! My BF always swears beef heart is good but for some reason the idea of eating heart freaks me out a bit. I think it was from dissecting them in school. I’ve eaten brains, love liver and sweetbreads, but I guess heart is the final frontier. This makes it look pretty tasty I have to say! In all my time in London living 5 minutes from it, I never got to to St.John, their reputation for offal (and squirrel) preceded them and noone would join me! I can understand being squeamish about heart. There is a reason I took the photo of it untrimmed from the side that I did! Too “real” otherwise! But out of all the organs, I feel like it is the least organ-y because it’s just a big muscle really. If you like liver and sweetbreads, I think you would like heart too! And to live so close to St. John! You are incredibly lucky. I went to Bread and Wine alone for the same reason: no one would join me! But there is something incredibly decadent about eating lunch or having a meal as a party of 1. Okay Baconb.. I don’t know if i could do beef heart lol. But I must admit, it looks absolutely delicious. And for V-Day you presented a heart.. lol I love it girl. This looks yummy. I adore chicken hearts grilled yakitori style but don’t think I have eaten a single beef heart in my life. Think of all those bovine beaters gone to waste. Offal is on my culinary bucket list. I just need a little more courage. If you like, would be a wonderful addition to Our Growing Edge too. If you try beef heart, do let me know how it goes! Potential disasters make it all the more exciting! This is very true 🙂 You learn more too! Thank you! If you get one, let me know how it goes! Thanks for the comment, Malou! I hope so! It is truly a nice treat!